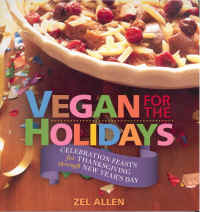 We love to experiment with different ingredients and recipes, so at least once a week we have something that we never had before in our more than 26 years of vegan cooking; however, we haven't made many fancy dishes for the holidays, such as the ones that Zel Allen presents in her book, Vegan for the Holidays. This is going to change. The book is organized into five recipe sections: Thanksgiving, Christmas, Hanukkah, Kwanzaa, and New Years, in addition to an interesting Introduction and Glossary. There are recipes for soups and appetizers, main dishes, sauces and gravies, soups and snacks, salads and dressings, and of course delicious desserts. Most of these recipes aren't for people counting calories, but hey, we don't have holidays every day, so let's just enjoy ourselves with those close to us. And, since all the recipes are vegan, we have the added pleasure of knowing that no animal had to suffer or die for us to enjoy these special days. For anyone who likes to cook and prepare special holiday meals and snacks for family and friends, Vegan for the Holidays is a must have book. When Zel Allen got married, she didn't know how to cook, but she acquired a husband with a daring and venturesome palate. As the kitchen adventures grew, so did Zel's cooking ability, eventually blossoming into a catering business. When a focus on healthful eating opened a new door, the vegan journey led Zel to partner with her husband, Reuben, to publish Vegetarians in Paradise, an online vegetarian magazine read by more than 100,000 visitors a month. Together they write and edit articles that provide a wide range of resources for the vegan community. The publication spotlights Zel's humorous illustrations and her innovative recipes. Presently, Zel spreads her message of a healthy vegan lifestyle by teaching vegan cooking classes. She lives in suburban Los Angeles, with her husband and once homeless cat, Fuzzy.